Some may call it a gimmick, but waterproof speakers are here to stay. It might've been a passing fad when the first few manufacturers, like Ultimate Ears (UE, for short) and JBL, first started releasing these water-tolerant audio devices a few years back, but now they're a staple of the market. But even in an increasingly crowded field, the UE Roll 2 manages to stick out. The latest IPX7-rated speaker from the manufacturer offers improved sound from the original on top of a reduced price tag – the Roll 2 sells for just $99 (£80, about AU$100). While a muddy bass keeps it from becoming one of the best portable pieces of audio hardware out there, a solid waterproof coating, detailed mids and surprising range make it a definite contender for the crown. You might take one look at the all-new Roll 2 and think, "Where have I seen this before?" Nine times out of 10, the next iteration of a product looks like the one that came before it – but, in the UE Roll 2's case, the resemblance to its predecessor is uncanny. More or less, this is the exact same shell that Ultimate Ears released with its first iteration of the UE Roll, but now with an expanded color palette that includes a super trippy graffiti design. Should you decide you want your speaker's volume to be louder than its design, I recommend going for the Atmosphere color scheme, which balances a blend of red and blue up front and maroon on its backside. Other options include Volcano (red and black), Habanero (orange and sky blue), Sugarplum (purple and yellow) and Reef (cerulean, lime green and orange stitching). Like the patterns themselves, the speaker's controls are creatively simplistic. On the front you'll find massive plus and minus buttons that raise and lower the volume respectively. On the back, you'll find power and Bluetooth sync buttons a few inches away from a sealed compartment for the microUSB and 3.5mm auxiliary ports. UE covers the tweeters with a fabric mesh that doubles as a protective grille. 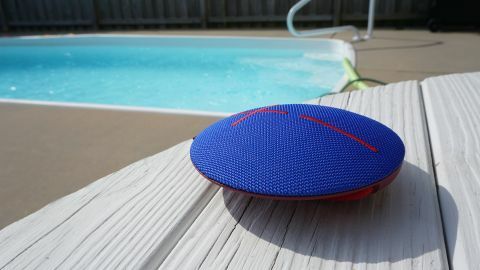 Then, once you flip it over, the speaker makes a smooth transition from fabric to matte rubber. The attention to detail on the design is commendable, with UE even including an elastic strap that allows you to hang it from your shower or strap it into the included flotation device when you're ready to hit the pool. Taken out and about, the UE Roll 2's battery is rated for about nine hours of playback, but can vary depending on the volume and genre of the music. Overall, the speaker is surprisingly lightweight – coming in at 330g – and far from massive at just 5.3 inches in circumference and 1.2 inches in height. That said, the UE Roll 2 is sturdy and as likely to survive a day at the beach as it is to weather a day bouncing around in your bag. Similar to the original Roll and the now-discontinued UE Mini Boom, the Roll 2 experience is enhanced with the companion app for Android and iOS. It can power the speaker on or off remotely, the equalizer can be adjusted and, if you have another UE speaker, you can pair the two together for stereo sound. None of these features really do much to make the offering totally irresistible, but any extra bit of functionality is welcomed. Finally, the Roll 2 is IPX7 certified, meaning it can survive being submerged under one meter of water for a half an hour before totally becoming obsolete. I didn't test it for the full half hour, but the Roll 2 easily survived quick two- to three-minute bouts underwater. While the exterior of the Roll 2 remains largely unchanged from its predecessor, the team at Ultimate Ears have completely re-crafted the internal components this time around. The Roll 2 is a surprisingly boisterous little speaker. It doesn't get as loud as my in-class favorite, the Creative Sound Blaster Roar 2, but it has enough volume to fill a medium-sized room without issue. Unfortunately, though, it's not as well-rounded of a sound as I might've liked. While the Roll 2 has exceptionally clear mids and highs, its low-end is rather muddy – probably due, in part, to the waterproofing process. Most of the songs on my go-to Pandora station (Today's Alternative, in case you're wondering) sound good, but not exceptional. You'll never have a problem with vocal tracks – in 99% of the songs I listened to, the lead singer came through well above the instrumentals. The same could be said for snappy snare drums and any additional percussion but, on the other hand, most of the time the bass was lost in overall sound. If Ultimate Ears would've opted to include AptX functionality, this might not have been the case … but it's not here and its absence is something potential buyers will have to live with. If IPX7 certification isn't a chief concern, there are plenty of other speakers that sound better with even richer tonality for around the same price. If waterproofing is key, however, the UE Roll 2 is about the best sound you're likely to find for the price. If you don't necessarily need a waterproof speaker, the UE Roll 2 has a bolder older brother, the UE Boom 2, that we granted our Editor's Choice Award to at the end of last year. That said, its bungee cord makes it an option that can cling to places that most portable speakers can't. Plus, an IPX7 rating means it has no problem taking a quick swim if someone accidentally kicks it into the pool. On top of that, the companion app offers several additional features, some of which are useful (and others that aren't so much). There are no doubt other options out there but, if you want a speaker with a wild design, exceptional clarity around the mids and highs, an unbeatable wireless range and don't mind a lack of low-end, Ultimate Ears's Roll 2 is the epitome of water-resilient audio equipment.